What’s the best thing about having a husband who cooks? For me, it’s really about the wonderful surprise edible gifts that show up on our dining table at home. Often, he would get these inspirations after watching a particular cooking program or flicking through a magazine or a cook book. Then he would excitedly tell me about this dish that he would either have to create or replicate. I usually nod off and go to sleep. Now before you go all up in arms about my lack of active listening, know that this is a regular occurrence that usually takes place just as I’m about to fall asleep in bed close to midnight. However, in the morning when we are both awake, I tend to replay the one-sided conversation from the night before and recap it. It is then usually The Boy’s turn to gaze at me blankly, as if my voice in his head was a mere buzzing sound (this has been verified by him as well). It’s a wonder that we get anything on the table when we are in the kitchen together! So, after the long segue above, The Boy knows how to get in my good graces. Cooking doesn’t cut the mustard anymore. He has to serve up special dishes. That speak to both my heart and soul. This usually involves deep frying foods. 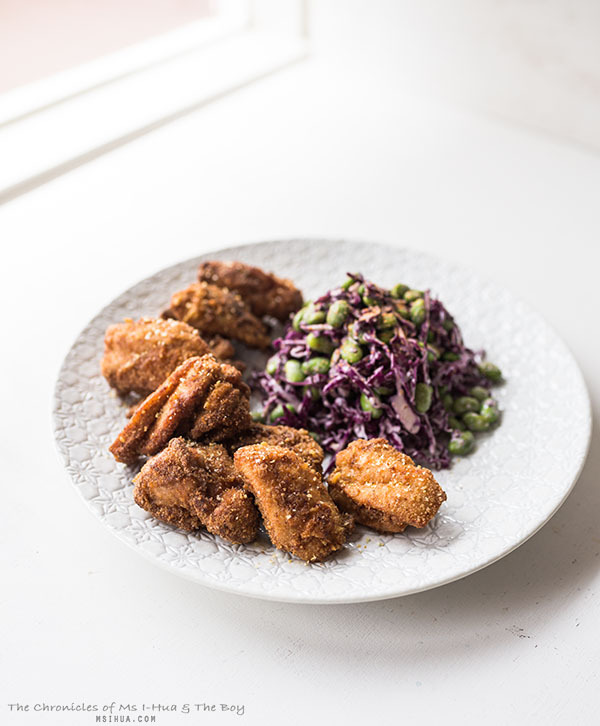 So here is a Ramen Fried Chicken recipe as inspired by the one and only David Chang, served with a Red Cabbage & Edamame Slaw. Prepare the brine by combining water, salt and sugar in a saucepan over high heat. Stir until the sugar and salt dissolves. Remove from heat and set aside to cool. Add chicken pieces into the cooled brine and refrigerate for 3-4 hours. Take chicken out of the refrigerator and remove from brine 30 minutes before deep frying. Grind 3 packets of noodles into powder form using a spice grinder (it helps if you break them into smaller pieces before adding into the grinder). For the last packet of noodle, pound it into small bits by using a mortar and pestle (or by placing it into a zip lock bag and pounding with a rolling pin). This is to get small crunchy bits of noodles into the batter. Mix both types of ground noodles together. Add 2 packets of seasoning into the mixture and combine well. Mix 1 packet of seasoning into the buttermilk. Coat chicken pieces with the buttermilk mixture. Heat oil in a deep fryer (170ºC or 340ºF). Working in batches, remove chicken from buttermilk, dip into ground noodles mixture, and add into oil. Cook until crispy and golden brown to an internal temperature of 75ºC or 165ºF (depending on the cut, it may take between 6 - 12 minutes). Remove cooked chicken from the fryer and place onto a wire rack. Sprinkle the remaining packet seasoning contents, some shichimi togarashi and yuzu powder over chicken while still warm. For the slaw, combine shredded red cabbage, cooked edamame, goma dressing, kewpie mayo and shichimi togarashi and mix well. 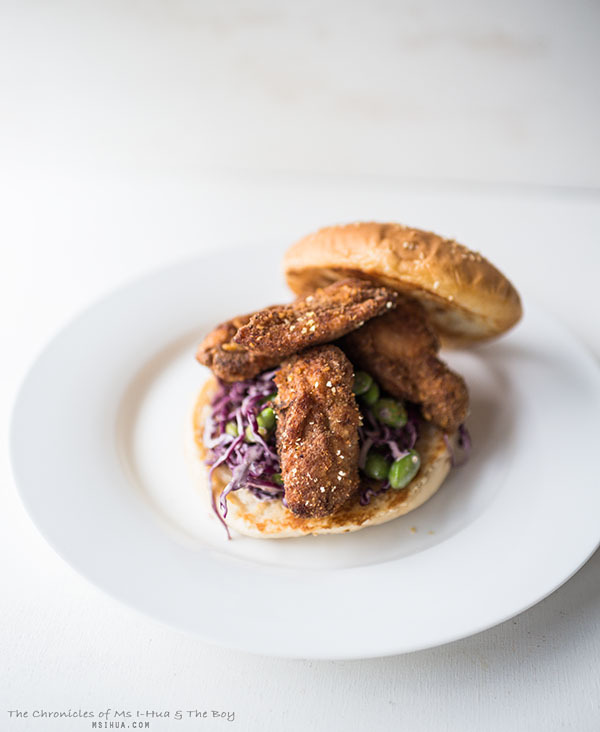 Serve chicken hot with the slaw. We’ve even had it served as a burger. It was amazing and utterly delicious. 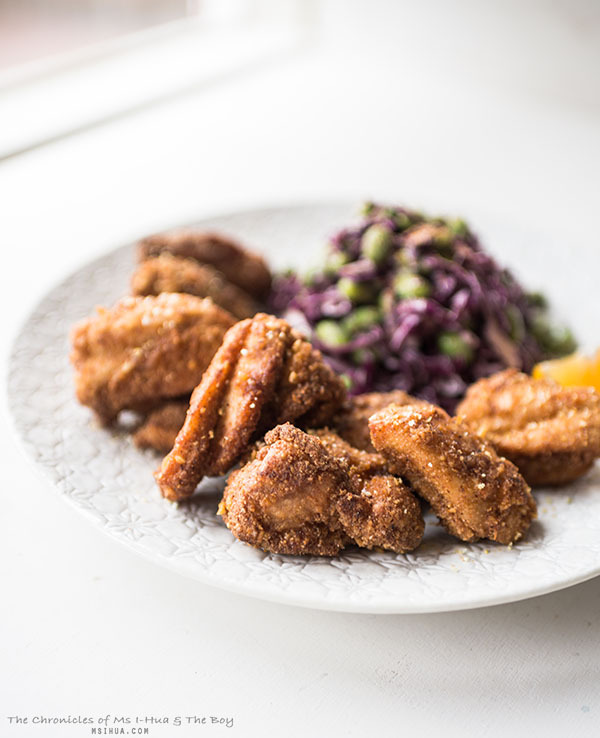 What’s been your favourite fried chicken recipe so far?